As early as 2014, the executive director of the National Congress of American Indians kept multiple allegations of sexual, racial and workplace harassment from the organization’s executive officers and board members, incidents only made known to them by whistleblowers, a High Country News investigation has found. During that same period, documents show, details of at least one of those sexual harassment complaints were known to the man who had been accused: John Dossett, at that time an attorney for the organization, was identified in complaints by at least two women. He denied the allegations, was reassigned from general counsel to senior counsel in the wake of accusations and has since left the organization. Nearly 40 tribes have issued votes of “no confidence” in the leadership of Jacqueline Pata, above, the executive director of the National Congress of American Indians, or have called for her firing or suspension. Founded in 1944, NCAI calls itself “the oldest, largest, and most representative American Indian and Alaska Native organization serving the broad interests of tribal governments and communities.” Yet in the span of 18 months, the organization has seen the departure of nearly 20 staff, including its chief financial officer, director of operations and deputy director. Now, it faces even greater upheaval at its highest ranks, as members call for an investigation and the suspension of NCAI’s executive director, Jacqueline Pata. To date, nearly 40 tribes have issued votes of “no confidence” in Pata’s leadership, or called for her firing or suspension. While recent coverage has framed turmoil at the organization through the lens of #MeToo allegations, documents obtained by HCN and interviews with former employees and board members reveal a work environment often so hostile that it impeded the organization’s ability to fulfill its mission and enabled key staff members to harass fellow employees physically and verbally without fear of punishment. During that same time period, NCAI employees sought help dealing with the organization’s systems administrator, Chris Pata, Jacqueline Pata’s husband. In March 2017, for instance, a conflict between Chris Pata and his supervisor, chief financial officer Sam Owl, culminated in Jacqueline Pata’s decision to bring in a third-party moderator, an act that circumvented the organization’s protocols. According to emails obtained by HCN, Jacqueline Pata refused to recuse herself from the conflict and prevented Owl from gaining access to human resources representation — ignoring the organization’s established procedures. Whistleblower complaints received by then-President Brian Cladoosby and then-Deputy Director Robert Holden alleged that Jacqueline Pata retaliated against the employees who were involved, restricting their travel privileges and denying them access to internal calendars and documents. Multiple attempts to reach the Patas for comment were unsuccessful. Interviews and documents reveal the handling of such incidents as representative of an office run by the whims of the couple and subject to Dossett’s frequent outbursts. Multiple sources who spoke with HCN on the condition of anonymity claimed to have brought verbal complaints to senior staff regarding the behavior of both Dossett and Chris Pata. But no one received acknowledgement in writing of their claims, and no apparent action was ever taken prior to Dossett’s reassignment. At one point, Dossett, who is non-Native, sent a belittling, racially charged email to the organization’s Native chief financial officer, accusing the staffer of wanting to turn NCAI into the Bureau of Indian Affairs — the widely disliked federal agency charged with providing services to American Indian and Alaska Natives. “When did we decide to do this?” Dossett wrote. “The auditors got together and decided that the lawyers need to fill out a bunch of paperwork? Maybe we should get the legal team together and start thinking up some fun things for the accounting department to work on.” Dossett’s comment came in response to an employee who had asked staff to comply with federal rules by adhering to the organization’s procurement policy. 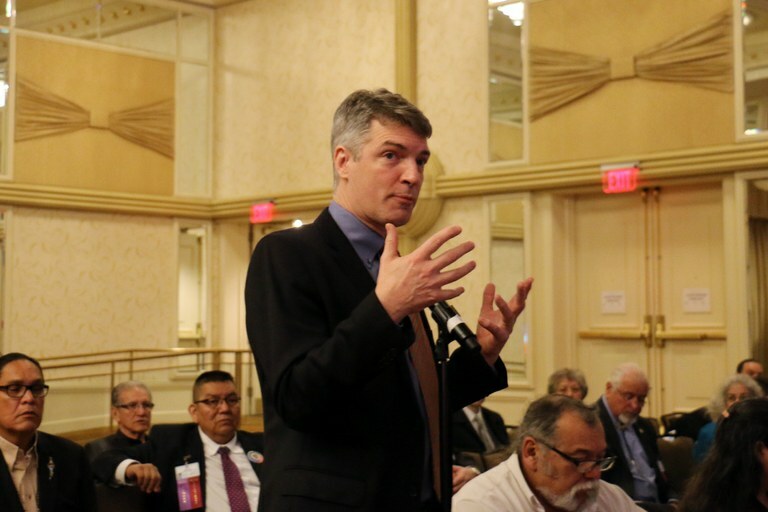 Former NCAI Attorney John Dossett is accused of unwanted touching of a female employee and of making crude sexual remarks to coworkers at a 2016 conference. At least six former employees said Jacqueline Pata’s refusal to discipline either Dossett or her husband hastened the departure of many staff members. In a resignation letter sent to executive committee members and made public in August, the former director of operations, Nicole Hallingstad, estimated an 80 percent staff turnover rate for the organization, with 11 departures in 2018 alone and 33 full-time staff departures since 2015. 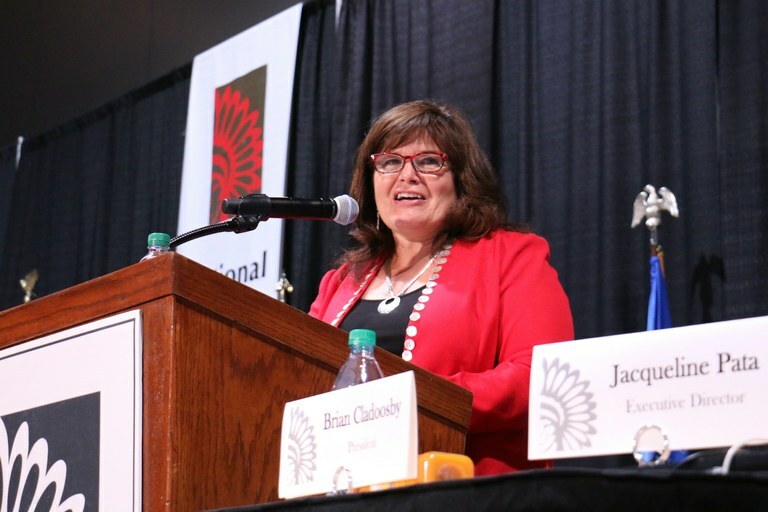 In March of 2017, whistleblowers contacted NCAI’s then-president, Brian Cladoosby, to report a hostile work environment, Pata’s repeated attempts to circumvent protocol, and the organization’s refusal to investigate the Spokane sexual harassment incident. Cladoosby was alerted again in June 2017 and also given a memo written by a former employee and sent to senior staff in 2014. The employee had accused a coworker and two board members of sexual harassment and racial discrimination, alleging that the coworker had made unwelcome remarks about her looks and “told me how he would like to do me a favor and help to get me, what he saw as, a better job.” Inappropriate comments continued, the woman wrote, culminating in an incident where the coworker “walked into my office, shut the door, hugged me tightly, kissed my cheek, and tried to kiss me on the mouth.” It remains unclear whether any disciplinary action was taken. According to an individual with close knowledge of the organization, when Cladoosby asked Pata about the Spokane incident, Pata claimed that the female employee did not file a complaint about Dossett until November 2016. But Pata assured Cladoosby that the situation had been dealt with. However, sources with the organization at the time say the incident was reported within two weeks of its occurrence. Assuming that it had been handled, Cladoosby then requested assistance from executive officers Aaron Payment, Ron Allen and Fawn Sharp in investigating Pata’s conflicts of interest with regard to her husband. The committee’s initial choice as investigator was John Dossett. It is unclear if an investigation ever took place. Last February, emails show that Pata received and acknowledged a second allegation of sexual harassment against Dossett, but apparently failed to share it with executive members. That same month, Pata assigned a senior policy adviser, Virginia Davis, to investigate the incident, but the fact that Davis reported to Dosset prompted concerns from the woman who filed the complaint. Pata eventually brought in an outside attorney to investigate. According to a statement issued this month by current NCAI President Jefferson Keel, “The investigation concluded with recommendations that NCAI promptly implemented.” However, Keel declined to release those findings to the membership for review, claiming it would “jeopardize” the privacy of those involved. The organization’s external affairs director, Jamie Gomez, declined an HCN request to interview Keel. (Gomez is Jacqueline Pata’s daughter.) However, according to Keel’s statement, the organization has formed an ad hoc group “composed of tribal leaders who serve on the Executive Committee to review how allegations of misconduct have been addressed previously by the organization.” Keel also said that a workplace-culture audit is underway and that NCAI is taking steps to strengthen its working environment. “Part of maintaining a positive, healthy work environment is providing staff a space where they feel comfortable bringing workplace issues to our attention without fear that their concerns will be released to the media for dissection by the public or otherwise shared with outside sources,” Keel wrote. How these allegations are addressed could have a significant impact on the organization, which has an annual reported revenue of more than $3 million and is supposed to represent tribal interests throughout the United States. Not only have key staffers left, but the inner turmoil is impacting the membership. After #MeToo allegations broke against John Dossett in August, the Pokagon Band of Potawatomi Indians canceled its membership. Meanwhile, calls for an investigation and Pata’s suspension have been filed by the United Tribes of North Dakota, the Ute Indian Tribe, the Cheyenne River Sioux Tribe, the Fond du Lac Band of Lake Superior Chippewa, the Montana and Wyoming Tribal Leaders Council and the Great Plains Tribal Chairman’s Association — turmoil which may slow the organization’s advocacy on behalf of tribes. NCAI meets in Denver for its 75th annual convention the week of Oct. 21.